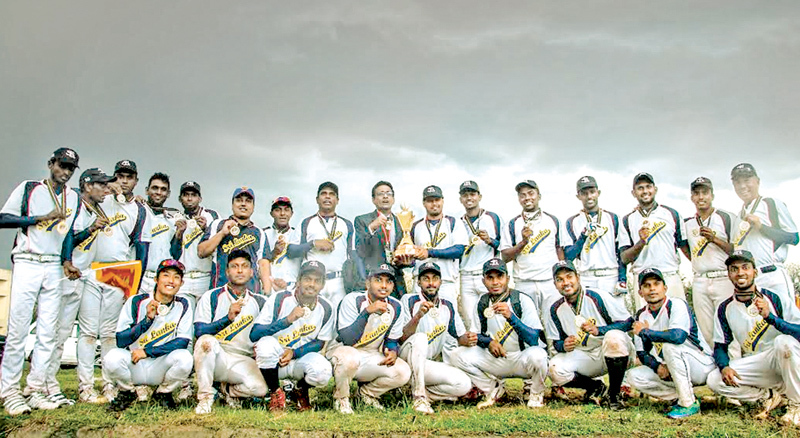 Minnows Sri Lanka created an upset to beat world number 24 Pakistan by four runs to two to win the final and be crowned West Asia Baseball champions as the 13th West Asia Baseball Cup concluded in Islamabad, Pakistan recently. Sri Lanka, a lesser known country for baseball with a world rank of 52 put up a tremendous performance throughout the tournament. Five nations namely, host Pakistan, Iran, Iraq, Sri Lanka and Nepal competed in the tournament. Even though India confirmed their participation, due to visa issues they could not take part. Sri Lanka commenced their campaign with a moral boosting 22 runs to nil win over Iran while Pakistan defeated Nepal by 16 runs to 1 in the first round. Pakistan beat Iran by 11 runs to nil in the first semi-final and Sri Lanka edged out Nepal in the second semi-final with the identical scores (11-0) to book their berth in the final. Sri Lanka continued their dominance over Pakistan in the final despite Pakistan’s home advantage. Iresh, Sandun, Sameera and Asanka scored a run each for Sri Lanka while Zawar and Wasim added a run each for Pakistan. Sri Lanka played under the captaincy of Akalanka Ranasinghe and the squad to Pakistan comprised 18 players, 3 coaches, an umpire, physiotherapist, and head of delegation, manager and selection committee chairman. This is the first time that Sri Lanka has won the gold medal at a West Asia Baseball Cup tournament. Sri Lanka’s victory was mainly based on their experienced coaching panel headed by Malindu Hewage. He was assisted by well experienced two Japanese coaches, Hideki Koyama and Kazuya Yagi. Malindu has undergone 10-month training at ‘Toyo Carp’ in Japan one of the best professional baseball clubs in Japan. Iran beat Nepal 10-6 to take the Bronze medal. For Iran Nima, Davood and Iman score 2 runs each while Ali Godorgi, Majid, Mojtaba and Yasin contributed with one run each. For Nepal Achit Karki, Sukrim Thapa, Dinesh Singh, Milan Thapa, Man Kumar and Binod Koirala scored a run each. The Sri Lanka team comprised H. K. K. Akalanka Ranasinghe (Captain), Sameera Sampath Rathnayake (Vice Captain), P. M. Iresh Kosala, U. H. Nelanka Karunarathna, H.S. Ruwan Kumara, Asanka Lakmal Peris, M. U. M. Lasantha, Sanjeewa Manna Uthum, H. D. Charith Krishna Hapuarachchi, B. G. Sanjeewa Udayasiri Jayarathne, H. A. Aruna Shantha, K. A. Sandun Madushanka, P. H. Tharidu Madumal, W. M. Saliya Anuradha Wijesinghe, G. G. Sahan Avishka Dias Gunasekara, W. Subas Isara Gunasiri, K. M. Naween Anuradha. Officials - Malindu Hewage (Head Coach), Hideki Koyama (Coach - Japan), Kazuya Yagi (Asst. Coach-Japan), Manoj Fernando (Head Of Delegate), Dinesh Perera (Manager), Ajith Kumara Indika (Phsiyotherapist), Priyantha Peiris (Umpire), Subash Gunasinghe (Selection Committee Chairman).